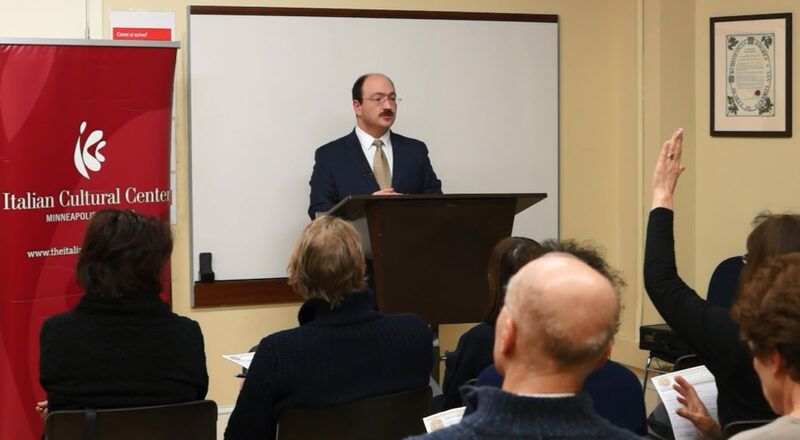 On February 2, 2017, Mr. Eugene Sherayzen, the founder and owner of Sherayzen Law Office (an international tax law firm headquartered in Minneapolis, Minnesota) gave a lecture at the Italian Cultural Center in downtown Minneapolis. The topic of the lecture was an introduction to US tax reporting of Italian assets and income for individual taxpayers. 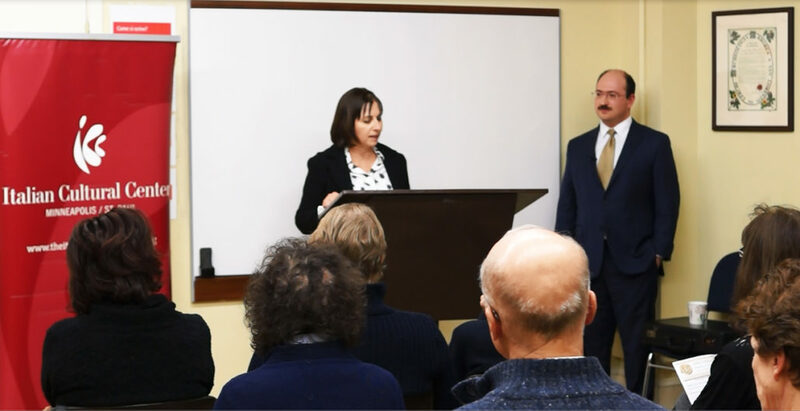 The lecture was well-attended by mostly native Italians (the room was filled to capacity) and caused a great amount of interest in the audience. The lecture commenced with the discussion of the worldwide income reporting requirement. After explaining the US tax residency requirement, Mr. Sherayzen focused on the importance of reporting Italian-source income in the United States for those Italians who are considered to be US tax residents (i.e. US citizens, US permanent residents, persons who satisfied the Substantial Presence Test and the US tax residents by choice). The lawyer explained that the Italian-source income must be disclosed by these Italians even if the income is already taxed in Italy and even if it is never brought into the United States. Then, Mr. Sherayzen discussed the subject of reporting by Italians of their foreign real estate and income derived from foreign real estate. The international tax lawyer emphasized that foreign rental income and foreign capital gains must be disclosed on the taxpayers’ US tax returns. Then, Mr. Sherayzen clarified that, in situations where real estate is owned outright by individuals (i.e. not through any entity or any other complex arrangement), the ownership of the real estate itself is not generally reportable. However, if the Italian real estate is owned through an entity, then it will need to be disclosed as part of the entity’s financial statements prepared as part of Form 5471, 8865 or 8858. The lawyer again emphasized that, even in these circumstances, the income derived from Italian real estate is still reportable on the taxpayers’ US tax returns. After discussing real estate as an exception from the general rule that foreign assets are likely to be reportable on the information returns in the United States, Mr. Sherayzen turned to the subject of reporting of foreign accounts with particular focus on FBAR and FATCA Form 8938. The discussion focused on the types of accounts that needed to disclosed, the reporting thresholds, and the penalties associated with the failure to file these forms. The international tax lawyer also discussed in more depth the history of FBAR. This discussion caused a great number of questions related to FBAR, its thresholds and its relationship to income reporting. Fewer questions were asked with respect to Form 8938. Despite the time limitations, Mr. Sherayzen briefly discussed Form 8621 as a hybrid form. The lawyer explained that a “hybrid form” meant that Form 8621 was used for both, income tax reporting and asset reporting, with respect to PFICs. Mr. Sherayzen explicated, in a very general manner, what assets qualified for PFIC status and what were the income tax consequences of PFICs. The Minneapolis international tax lawyer warned the audience that their Italian private pension plans and life insurance policies could contain PFICs. 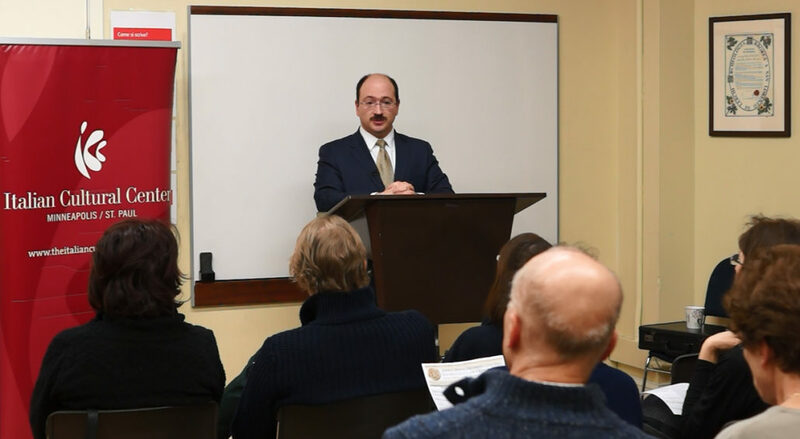 The lecture ended with a brief discussion of US tax reporting requirements concerning inheritance and gifts from Italian nationals and non-resident aliens (for US tax purposes). At that point, Mr. Sherayzen introduced Form 3520 and its threshold reporting requirements for foreign gifts and foreign inheritance. The lawyer also explained how Form 8938 could be applicable to a foreign inheritance. After the lecture ended, Mr. Sherayzen continued to take questions in private for the next thirty minutes.